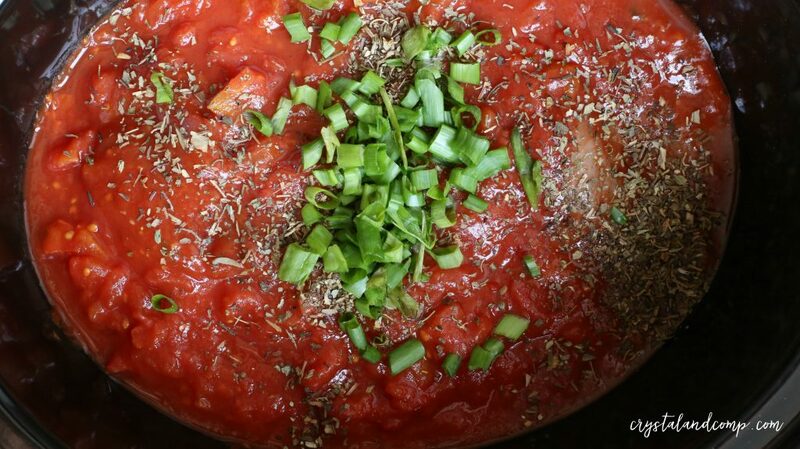 Have you ever had chicken that has been slowly cooked in a tomato-based sauce? 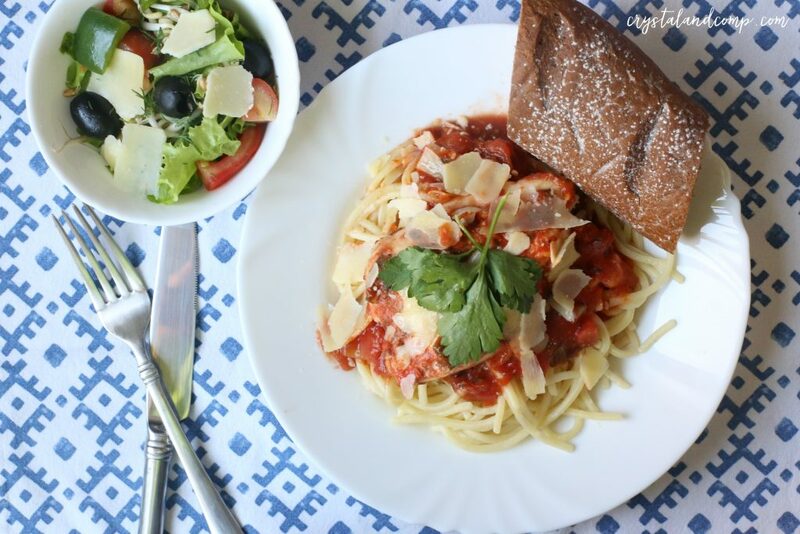 This Italian Crockpot Chicken is amazing! You will be shocked when you see just how easy it is to make. This recipe is a staple in our house. It is quick and easy to prepare as well as delicious. I love making this for on a busy weeknight. You could even convert it to an Instant Pot recipe and cook it in 20 minutes or less. Check out all of our easy recipes while you’re here. They are perfect for busy families. Salt and pepper your chicken breasts. Drop them in your slow cooker. I use this 6 qt oval Crockpot with a built in timer which is amazing!! 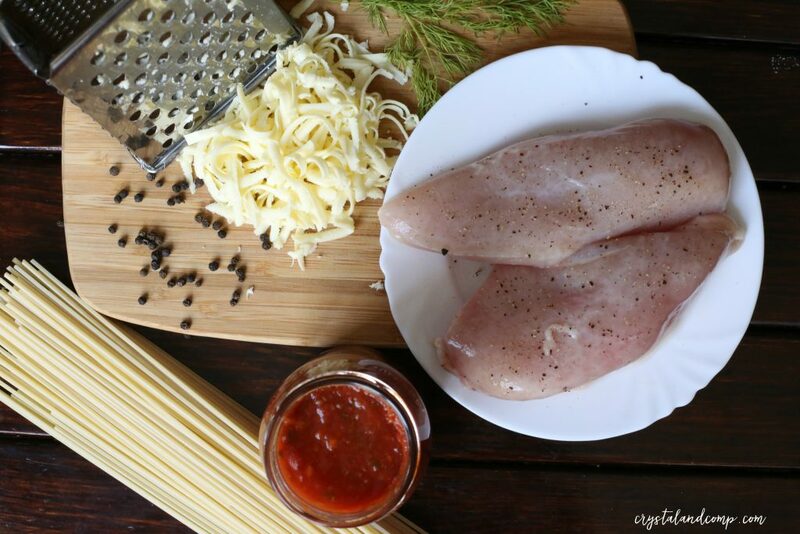 Pour the spaghetti sauce over the chicken breasts. I use two jars because I use the sauce over our pasta as well once it is done cooking. If you are opting out of the pasta or do not want sauce on your pasta, one jar of sauce is sufficient. Add in the seasoning and onions. Mix it up. Put the lid on the crockpot and cook on high for 4-6 hours or low for 8-10. When the chicken is in the last 20-30 minutes of cook time, bring a pot of water to boil and cook your noodles according to their package directions. I love egg noodles, but spaghetti noodles are a close second. Once the noodles are done, serve the chicken over top the noddles. Scoop a couple spoonfuls of spaghetti sauce over the chicken. Top with shredded Parmesan or mozzarella cheese. Drop your chicken in the crockpot.Frozen totally rocks. Pour the spaghetti sauce over the chicken. The last 20 minutes or so of chicken cook time, prepare your noodles according to the package directions. I use two jars, because I use the sauce over our pasta as well once it is done cooking. If you are opting out of the pasta or do not want sauce on your pasta, one jar of sauce is sufficient. Thanks for sharing…I am going to try these!! This looks great – and easy! I’m craving crockpot recipes now that we have officially entered Fall. Thanks! I am always on the lookout for crockpot recipes! Thanks! I’m planning on trying this recipe this week. I have made two previously posted recipes, the Crock Pot Lemon Chicken and the Crock Pot Chicken Enchiladas, and both were big hits with my family. Thanks so much, Crystal! You just made my day, Tam! I really appreciate your feedback. I hope your family enjoys this one too. It really has great flavor and is so easy. i love this, and do it a lot–last night, in fact! but adding these really makes the dish seem complex and i always get compliments! What an excellent solution Ruthie to add frozen onions and bell peppers. I like that and will certainly be trying it. Thanks so much for sharing (and reading!). Crystal, this is a great Crock Pot meal that we will really enjoy! Thank you so much for sharing with Full Plate Thursday. Hope you have had a great week end and come back soon! It’s in the crock pot right now!! Love an easy “on-hand ingredient” recipe for the crock pot! Thanks! Awesome, Amy. I am glad you found it to be a recipe that worked for your family. I didn’t care for how the chicken came out like shredded chicken rather than how I’m used to (specifically the texture) and the sauce was runny after cooking the chicken in it. 🙁 I like a thick tomato sauce. I like the taste but the texture of the chicken and the sauce was off for me. I wouldn’t make it again. I am going to re-purpose the chicken from the meal for enchiladas this week. Wonder if it would make a difference if the chicken was brown or on-the-bone chicken? That is odd. 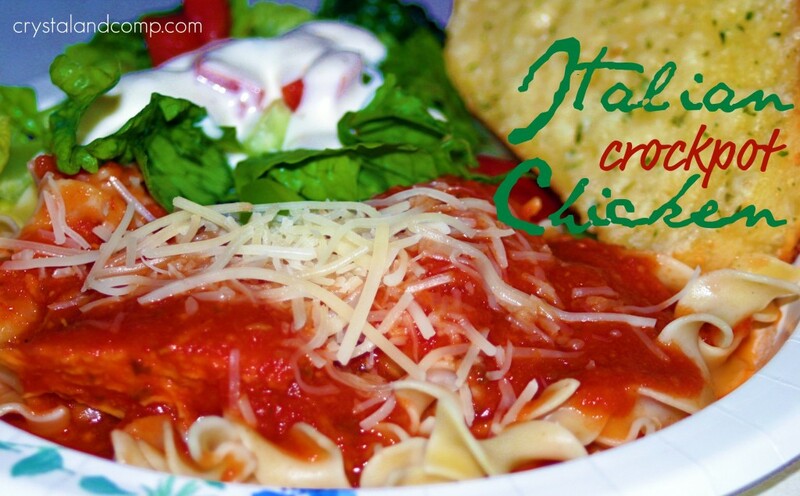 I always use chicken breasts and usually use Classico sauce but have tried others. My sauce comes out the same consistency each time and I even put my chicken breasts in frozen. Did you use breasts or try something different. Your chicken breasts just fell apart while cooking? How long did they cook and at what temp? 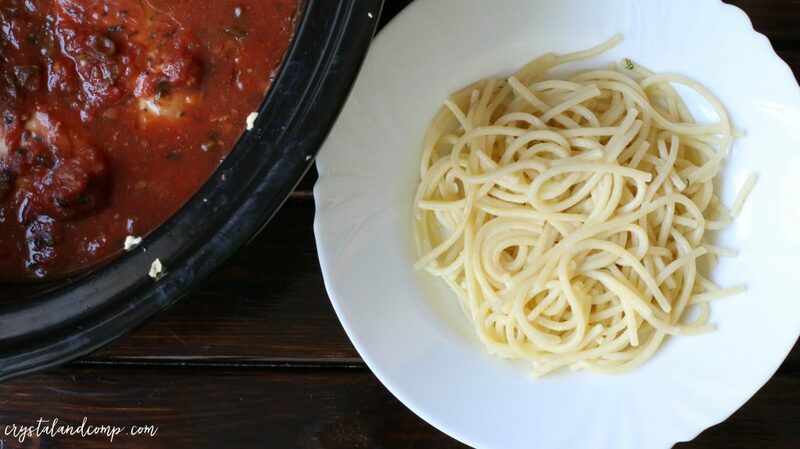 Did you use a thick spaghetti sauce and it turned thin while cooking? I want to make sure I fully understand. This has honestly always been a tried and true recipe for me that comes out the same every time. 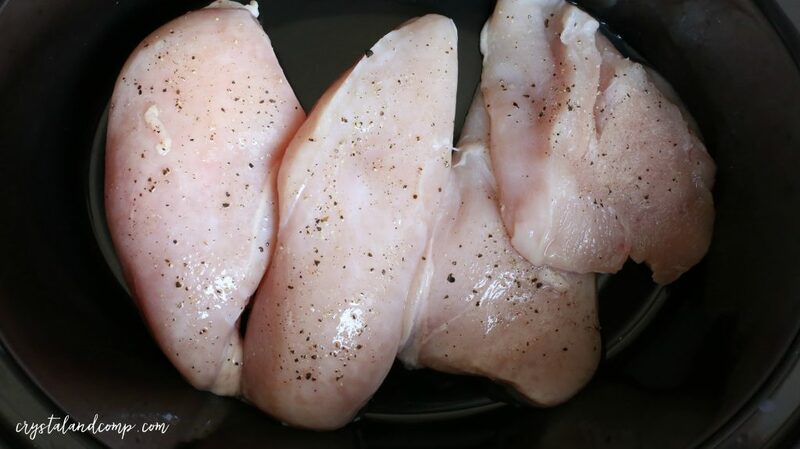 I thawed my chicken breasts 80% of the way before putting them in the crock pot. I put them in there about lunchtime on low and we ate dinner about 7:30. I had the crock pot on low the entire time. Perhaps I should have had them on low but only for maybe half that time. The sauce was much thicker in the beginning, and was like the consistency of broth when it was done…red colored broth. 🙁 The broth was tasty but it obviously didn’t stick to my noodles that I made. I will have to try this again I guess and just not cook it as long. I thought by putting it on low I was safe. I even put it on warm the last hr. and a half. I’m new to crock pot….I want to try this sooo bad looks so delicious! I do have a question for you…. should the chicken be cooked before putting it into the crock pot or thawed and raw should be good? It needs to be raw chicken. It can be frozen if you want. The crockpot will cook the meat. Hope that helps. I’m saving this recipe for when soccer season starts. Simple and delicious! 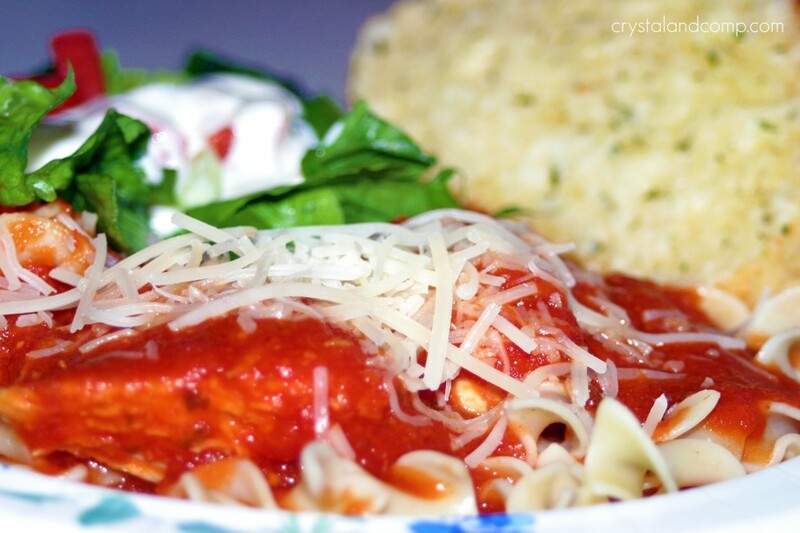 I love good, easy crockpot dinner ideas like this! It’s so helpful and really pretty healthy as well! Perfect with a simple salad on the side! 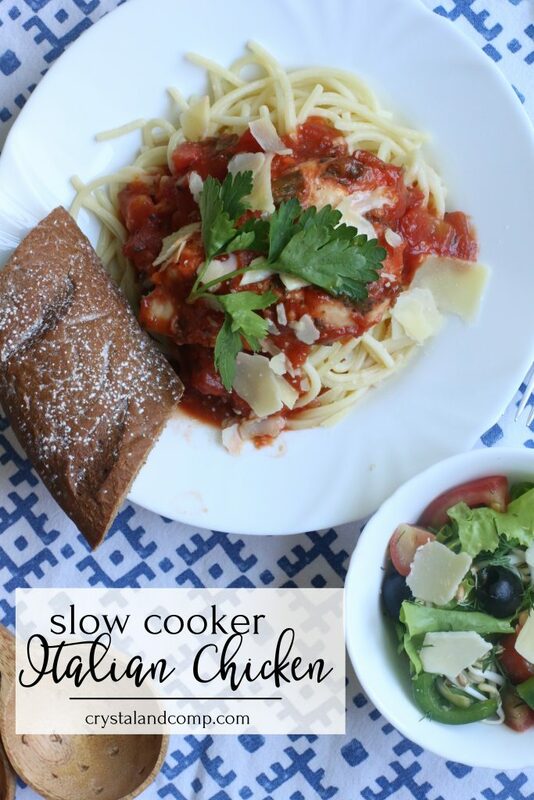 This was such a delicious and easy slow cooker meal! The whole family gave it 2 thumbs up!